A 50-person committee to draft an amended Egyptian constitution completed its work in December and dates for a referendum have been set for January 14-15. The military-appointed regime which came to power through an army coup on July 3 of last year is encouraging people to vote in the upcoming national poll. Concerns are growing among the regime operatives that a low turnout will damage the coveted “legitimacy” that they so desperately crave. A number of organizations have already called for a boycott of the vote based upon the undemocratic character under which the process was conducted. Opponents of the referendum include the Muslim Brotherhood as well as some secular left and liberal organizations which had initially supported the military coup of July 3. A new coalition has been formed calling itself the Way of the Revolution Front which includes the April 6 Youth Movement, the Revolutionary Socialists and the Egypt Strong Party. Nonetheless, the Salafist Al-Nour Party, which had fallen out with the government of Mohamed Morsi during 2013, is supporting the referendum. Other supporters of the referendum are the Social Democratic Party, the Socialist Party, the Popular Current, the National Salvation Front as well as the leadership of the Copts Church representing the Christian community in Egypt which constitutes approximately 10 percent of the overall population. Other Islamist groups are also boycotting the referendum including the Salafist Front, reputed to be one of the largest of such organizations in the region. In addition, the al-Gama’a al-Islamiyaa, another religious party, is also rejecting the referendum vote. The so-called Tamarod, or rebel group, which is credited with organizing the anti-Morsi demonstrations last June prior to the coup, says that it is supporting the referendum vote and has in the past encouraged military strongman, Gen. Abdul Fatah al-Sisi, to enter the upcoming presidential race. This new declaration is a clear attempt to encourage people to participate in what many in Egypt consider to be an illegitimate process. Rules that had prevailed during the local and national elections of 2011 and 2012 are being altered based upon a governmental decree. If the proponents of the military coup which deposed the elected government of ousted President Mohamed Morsi, who ruled on behalf of the Muslim Brotherhood allied Freedom and Justice Party (FJP), were certain that their actions enjoyed the approval of key sections of the Egyptian population there would not be these efforts which can provide the ability to manipulate the vote in the upcoming referendum. During the period of examinations at some of the leading universities in Egypt, students have been boycotting and staging mass demonstrations. Late last year the Egyptian interim government imposed a ban on unapproved protests. Numerous activists have been arrested and sent to prison for their involvement in actions that both oppose the law banning demonstrations as well as the existence of military rule and the staging of a national referendum to legitimatize the current political order. On December 22 activists Ahmed Maher, Mohamed Adel, both of the April 6 Youth Movement and blogger Ahmed Douma were sentenced to three years in prison in addition to monetary fines for violating the law prohibiting unapproved demonstrations. On January 3 at least 17 people were killed in clashes between coup opponents and the security forces in Cairo, Alexandria, Fayoum and Ismailia. Some 50 others were injured as police violently suppressed efforts to protest against the upcoming referendum. RT.com reported on January 4 that not only has the Muslim Brotherhood been banned but leading members of the organization have been faced with economic sanctions. These actions are an attempt to make it almost impossible for the group to function. A series of bomb attacks have also escalated tensions inside the country. These incidents have been blamed on the Muslim Brotherhood by the military regime even though they have been claimed by another organization, Ansar Bait Al-Maqdis. On December 24, fifteen people were killed in a bombing at the security directorate in the city of Mansoura in the Nile Delta region. Later on December 29 another intelligence building was destroyed in Sharqiya also in the Nile Delta where four soldiers were wounded. Also on December 29 a bomb was defused at a building in the Al-Azhar University medical complex at New Damietta city north of Cairo. Later on January 1 a bomb exploded near a bus in Nasr City in eastern Cairo wounding four people. In the Sinai region fighting has been taking place as well over the last several months. Reports indicate that some 100 police and military personnel have been killed in this natural gas producing region of Egypt on the border with the occupied Palestinian territory of Gaza. In response to these attacks, the United States Secretary of Defense Chuck Hagel pledged Washington’s support in investigating the incidents. Egypt is the recipient of $1.5 billion in annual assistance from the administration. Although the Obama administration claimed earlier in 2013 that it was suspending some aspects of its aid to Egypt, Secretary of State John Kerry later said during a brief visit to Cairo that this was not a comprehensive halt and that the U.S. would continue to maintain relations with the military regime in Egypt. 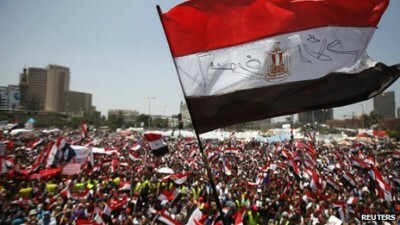 The politically sensitive situation in Egypt has created concern over criticism outside the country as well. Both the governments of Qatar and Iran have been cited by the Egyptian regime for alleged interference in the country’s internal affairs. The Qatar monarchy’s representative as well has been summoned by the Egyptian authorities. The government of Qatar had supported the previous government of ousted President Mohamed Morsi and pledged billions of dollars in financial assistance. These developments indicate that the current Egyptian government is placing a tremendous amount of weight on carrying out the January 14-15 referendum. The outcome of the vote and the new reconfiguration of political forces will determine the future of the struggle inside the country.